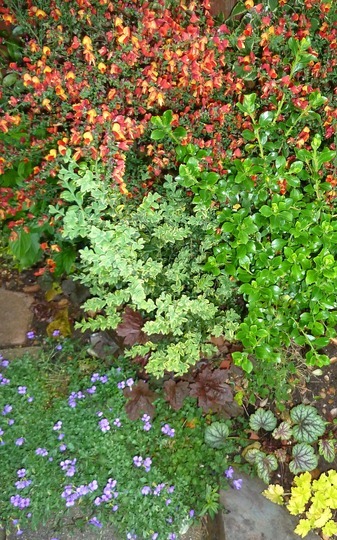 Cytisus Lena, aubrieta, escallonia, heucheras. Catching the light near my front door. Wow, thats a fantastic colour combination! Thanks Tog and Karen ..
Well, you are definitely a Master Painter TT! I like the quote .... It would be a disaster if everyone was like me lol ! Thanks everyone for your comments ..
lovely pic Terra, so much colour there.. Thanks Carole and Surreylad .. The splashes of colour seem to match well with Beth Chatto's quote ! Lovely colours and all looking so healthy. I wish I could remember what my plant names are. Can you not nip around and draw me a map of my garden? Saw Beth Chatto being interviewed at Chelsea.....was it yesterday? Love visiting her garden near Colchester. Last time we were there, I bought her signed book 'Dear friend and gardener'. I also bought Spotlight Heuchera too. She is such a clever gardener. Lovely arrangement near your front door TT. I have to label my plants or I'd never remember all their names ! Yes, Beth is such an innovative gardener ! Thank you... I've been "liking" everyone's blogs, but I can't keep up with all the lovely GoY photos ! I agree with Beth, thats funny cos thats exactly what i say! Hi Grandmage ... yes, you and Beth are both right ! Lol. Just wish that 'my' artistry could be a bit more like yours!!! A really lovely combination of plants. Love that red plant at the back,is it broom? Colour mixing is my thing too, particularly with my winter garden in mind, using as many evergreen shrubs as possible so that winter still has lots of colour. Happy gardening. Thank you. The plant at the back is Cytisus Lena... a broom type of plant. Many of my other photos and blogs feature evergreens, which might give you further ideas. I hope this helps.